Everything around me feels festive: My neighborhood takes holiday decorating pretty seriously, and for Christmas they’re breaking out all the seasonal decor, from lights and garlands to inflatable Snoopies sleeping on their doghouses. The five or so inches of snow I see from my window add a real coziness factor to a Sunday spent in the kitchen. And my first-ever grown-up Kelly’s Very Own Christmas Tree in my front window brings me a pride and joy so thoroughly adult that I almost want to keep the tree up til spring. As the song says, “it’s the most wonderful time of the year.” And I really believe that! I love the cooking, the singing, the decorating, the smiles, the spirit. This is a holiday that–at least in its modern, pseudo-secular incarnation–is all about generosity, sharing, and love. When you give a gift, the recipient feels awesome, you feel awesome, and through this bond the world gets a little more awesome for a little while. That’s pretty beautiful, whether you buy into the Bible stories or not. This is where toffee comes in. 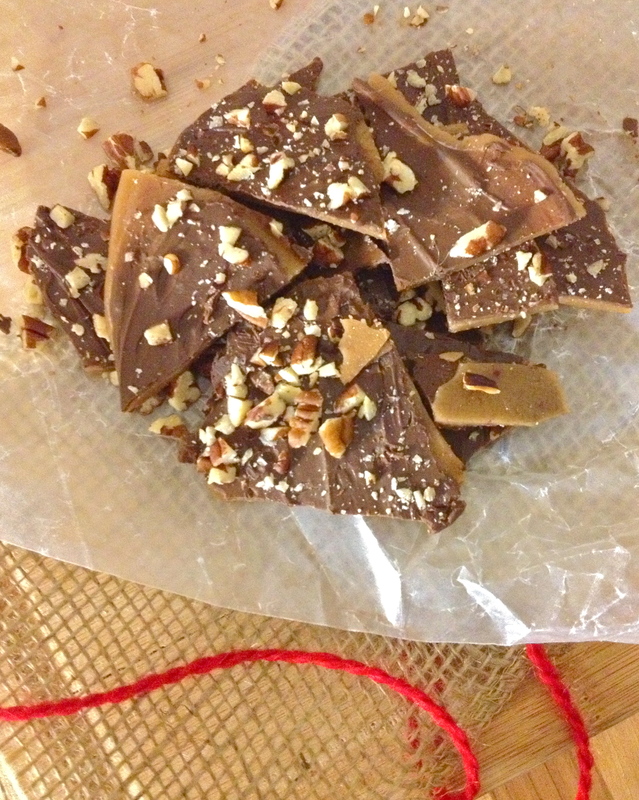 Whenever I receive a little bag of toffee as a Christmas present, I just get so excited about it. It’s so good. Sweet, buttery, crunchy, chewy, sticky…it’s everything a Christmas treat should be. 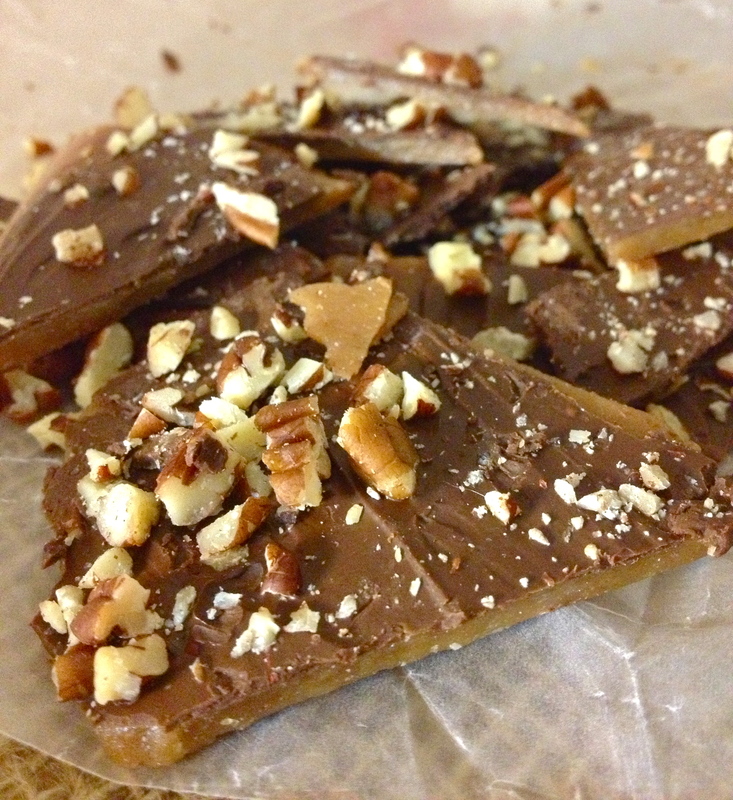 So I’m planning to share a few yummy toffee recipes this Christmas season, starting with this, a lusciously warm and toasty Butter Rum Toffee. Line a sheet pan with a silicon mat or parchment paper. Set aside; you’ll need it ready, because the caramelizing process moves pretty quickly. Melt the butter in a saucepan over medium heat. 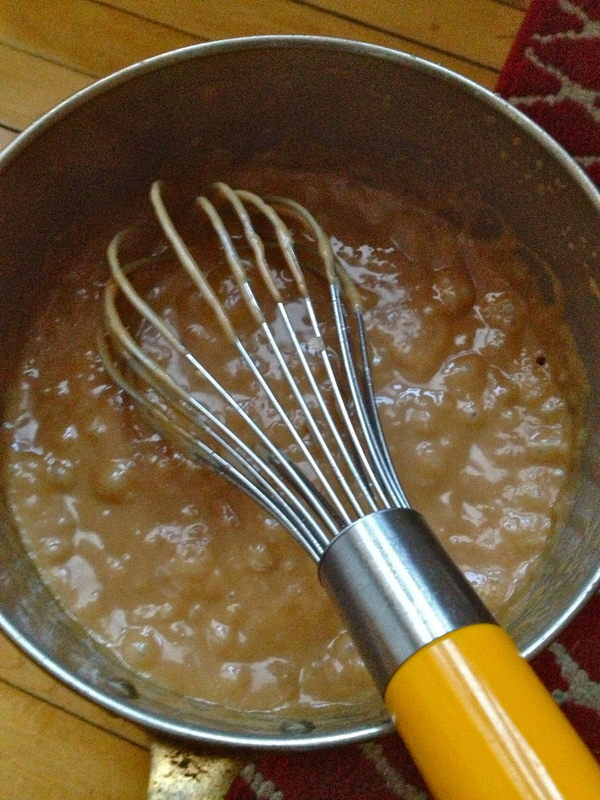 Then whisk in the sugar, rum, vanilla, and salt, and continue to stir with the whisk while the mixture comes to a bubble. Be very careful not to touch the mixture at any point in this process; it’ll give you an incredibly nasty burn. Cook over medium flame, stirring constantly, for 7-10 minutes, until the mixture is almond-colored and passes this consistency test: take a glass of cold water and drizzle in a few drops of the mixture. If it turns into brittle strings and crystallizes at the bottom of the glass (reach in and test the piece with your fingers), it’s ready to go. If it’s still soft and malleable, continue to cook and stir, and test again in a minute or two. Be careful not to let it burn. 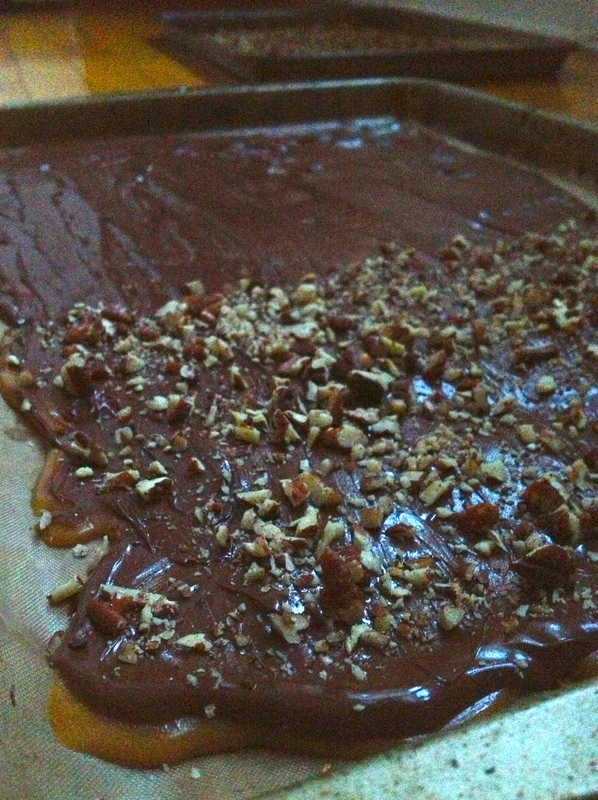 Once it’s ready, immediately pour the toffee onto the silicone mat or parchment paper that’s lining your sheet pan. Use a spatula to spread the mixture pretty thinly – don’t worry if it’s uneven, it’s all part of the magic of toffee. Let cool for 2 minutes. Next, sprinkle over the chocolate chips. Give them a few minutes to melt, and then use a spatula to gently spread the melted chocolate over the top of the toffee, covering the whole surface. If you find that the chocolate chips aren’t melting completely, pop the pan into a hot oven for 20 seconds, and the chocolate will be easily spreadable. While the chocolate is still melty, sprinkle with pecans and a bit more salt. 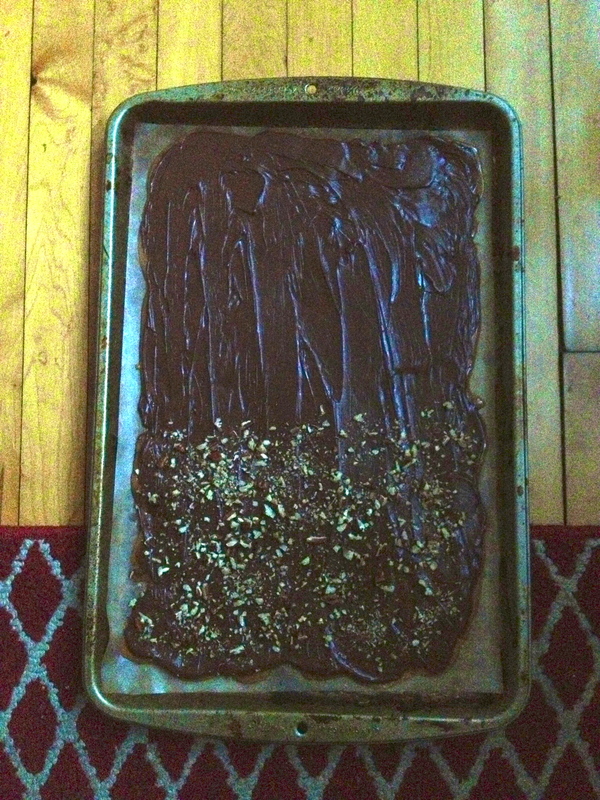 I topped half my toffee with pecans and salt, and the other half with just salt, so that a nut-free birthday girl could eat it. Let the whole thing set completely, for at least two hours. Then break it up into chunky, uneven pieces. Eat some of them (you gotta make sure it’s good, right? ), and give the rest away as gifts before you eat it all yourself. Previous Czech Goulash: Updated Recipe.